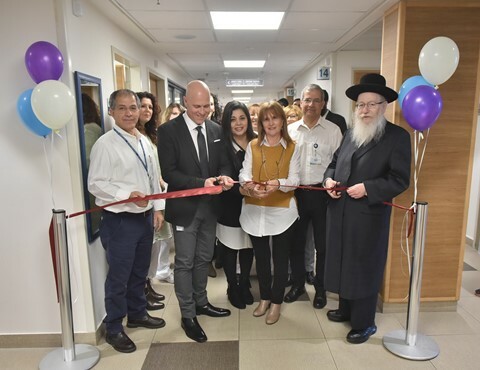 The initial Well-Baby Clinic is the result of cooperation between the Maternity Division at Hillel Yaffe Medical Center and the Hadera Health Office, which is responsible for the Well-Baby Clinics in the region. Women who have already had babies know that it is not simple to schedule an appointment at the Well-Baby Clinic and that there are long waits. That is why the initial visit in the Maternity Department is a welcome and necessary development. At a festive ceremony held last week to mark the launch of the service, MK Rabbi Yakov Litzman was also on hand. He said that it was important to him to be at the ceremony, because cooperation in healthcare for the benefit of the community is significant added value, and well-baby service is essential. He further stated that he hopes that other hospitals will follow suit. Well-Baby Clinics are stations that provide healthcare and medical services to women both before and after childbirth, to babies and children up to the age of six along with their families. For new mothers, it is a crossroads that is virtually a necessity, and the recommendation is that the first visit to a Well-Baby Clinic be made when the baby is four days old. This unique and very welcome initiative, which is new, has quickly become the discussion of the day. The new mothers know to ask for an appointment, and in the Maternity Division, the Well-Baby Clinic has already become a matter of routine. A routine that everyone knows and implements, in the best way possible, to ensure continuity of the care a new mother receives at the hospital and then in the community. In other words, it’s a routine that everyone benefits from and helps everyone relax.